Warehouses are commercial buildings used to store goods of all types until they’re sold or needed. These include raw materials, finished products, spare parts, supplies, equipment, food and just about anything else imaginable. Warehouses sizes range from a few hundred square feet to tens of thousands. The size depends upon the industry, location, and a business’s needs. They’re usually large, plain looking structures located in industrial areas on the outskirts of towns. Warehouses are also often found near rail yards, airports, seaports and other transportation hubs. This is because land costs and rents are usually less expensive. Typical warehouse features include loading docks for shipping and receiving products, roll-up overhead doors for loading and unloading goods at grade level and high ceilings that provide more vertical storage. Once goods are received and unloaded, they’re taken to the storage area by forklifts or pallet jacks, where they’re kept until needed. These are privately owned storage facilities used by many retail businesses to store inventory for future sales. Large retail chains might have several regional warehouses scattered throughout the country to resupply local outlets. Manufacturing companies use private warehouses to store their products until they’re ready to be shipped. Some wholesalers own private warehouses to receive, store and distribute their goods. Construction companies and engineering firms often own warehouses to store heavy equipment and building supplies. Although private warehouses are expensive to build or buy, they generally prove to be cost-effective over time. As with most warehouses, forklifts and pallet jacks are used to move items within the warehouse and retrieve them when they’re needed. Public warehouses offer both short and long-term storage space. They’re usually on a month-to-month basis. Public warehouses can store items for several different businesses at the same time. They’re a good option for smaller businesses that can’t afford to own or lease their own space. Many public warehouses offer more than storage space, including inventory management, control and shipping services. Businesses that have a short-term need for storage or distribution space often turn to public warehouses. When a retailer makes a large purchase in anticipation of a seasonal or special sale, but doesn’t have space in their own storage facility, they use a public warehouse. When their space is freed up, the company no longer needs the public space. These are large warehouses used primarily for short-term storage. They’re sometimes also called fulfillment centers. When used to ship products directly to consumers, they’re called package handling centers. 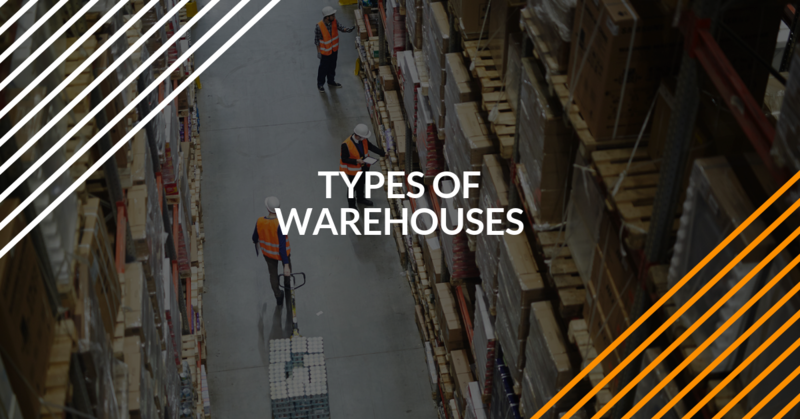 Warehouses are the part of a supply chain where products shipped from suppliers are received and briefly held before being sent to customers or end users. One example of a distribution center is a facility where fresh food and other perishable products with short shelf lives are stored. These centers are sometimes refrigerated or air-conditioned, depending on what’s being kept. Items received in the morning are often shipped out to customers the same day. When suppliers ship goods to huge retailers like Wal-Mart and Amazon, the products are unloaded, moved by forklift or pallet jack and stored until they’re needed by retail outlets. It’s possible to supply a hundred or more stores from a single distribution center. Today’s technology reduces the need for manpower in most industries, and warehousing is no exception. Because there are fewer human workers, very little supervision is needed. Automated storage and retrieval systems use the latest software and robotics to control inventory handling. Everything from conveyer belts and self-propelled forklifts to cranes and carriers move goods around buildings. These warehouses can be several stories tall and contain tens or even hundreds of thousands of square feet of floor space. Robotics are used for picking, sorting and delivering goods to a worker at a packing station, who then prepares them for shipping. Automated guided vehicles (AGVs) are used to move pallets or packing crates. AGVs navigate by either following markers or wires in the floor, or by using a system of magnets or lasers. Autonomous mobile robots (AMRs) use sensors and cameras to find their way around. Because they reduce labor costs, improve efficiencies and are scalable, use of automated systems and robotics in warehouses will continue to increase. In addition to air conditioning and dehumidifying equipment, other ways to help control the climate inside a warehouse include using sealing strips around doors and insulating the walls and ceilings. Local weather conditions are also a consideration, depending upon what’s inside. Warehouses in hot, humid areas such as the Gulf Coast will usually require more extensive climate controls than storage facilities in the Southwest and other dry regions. Regardless of the type of warehouse, they need properly trained and certified forklift operators to move, stack, retrieve and load pallets of inventory. A great way to become a certified forklift operator and open up new career opportunities is through ForkLiftCertification.com. It’s also convenient and affordable. Our OSHA-approved online training takes only about an hour to complete. Since all class materials are available online 24/7, forklift training can be completed using a smartphone, tablet or laptop any time and anywhere there’s an internet connection. To get started today, click here. You can also contact us online or call us at 888-278-8896 for more information.